Great post, Wes! Everything is working exactly as you described. Can you have OverrideCtx.OnPostRender call two functions? I’ve tried a few variations with no success – any insight would be much appreciated. I am trying to reproduce this example and seem to not be getting the same result. Do you mind spreading some light on what I could be doing wrong? Sorry, auto fill had a wrong email. where HighlightRowOverride is the name of your OnPostRender function. This also seems to solve the problem for search as well. From my understanding, _spBodyOnHashChange is triggered each time something after the # in the address bar is changed. In a Sharepoint list this happens during sort as it calls Inplview. If there is a better function to override to achieve the same effect I’d be glad to hear it as I’m rather new to SP and JS. Awesome post, thanks! The one issue I’m running into is this doesn’t seem to be working with IE 8. It works with all the browsers I’ve tested though. Any ideas what could be causing this? Thanks. Does anyone know why if there is some sort of race condition where you get page error on occasion page refreshed? The error occurred where I am assigning the row. I am unable to get this to work, trying to get it to work on a field named Status. Here is what I am using. Can you see anything wrong? Hi Wes! Thank you for your post. 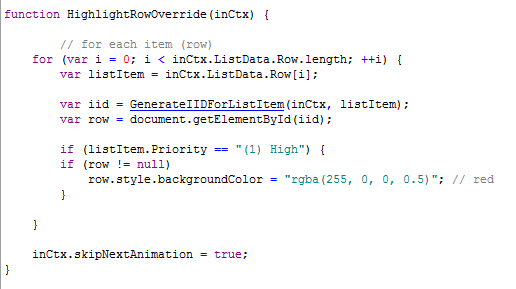 I think using the Item override is a better approach than using the PostRender method. Can anyone show the proper script for: “You can have multiple rules checking different rows and applying various colors if you wish.” Any help is greatly appreciated. hi, I have a list using default style and it is using grouping. I want to add a code using JS link in order to change the style to shaded but without changing the default style (because I dont want to loose the quick search box from the view), How can I do that? thank you for your help. How do I add a JS link. Hello! 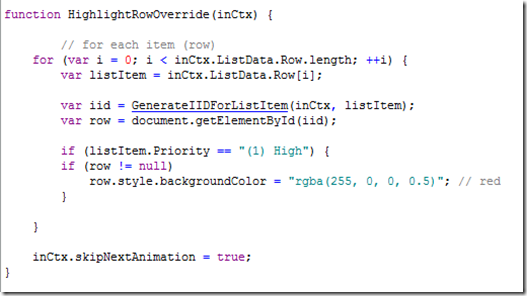 I was wondering if you ever posted your newest post revisiting highlighting using conditionals but so that it only highlights a cell and not the entire row. I was able to properly follow your guide to highlight the row that I need but I need/want to modify to just highlight the cell. If not, would you mind commenting on your thought process to achieve this? Thank you so much! Dave, I haven’t followed up on that one specifically. It depends on what you’re trying to do. Generally if I need to make a change to something in a particular cell I’ll just use a Field override and tweak the HTML, CSS, or whatever needs to be tweaked rather than handing it with jQuery and cell properties. What are you trying to do? I am running into issues getting my web part to recognize my JS Code. I have the JSLink referencing the SiteAssets library where I have my JS file saved. Here is my code. The field I am basing my condition on is called RenewalNeeded and it is a choice field – either Yes or No. Any ideas? Thanks Wes for the post! is ‘Marked’ the correct internal name of the field you’re checking?